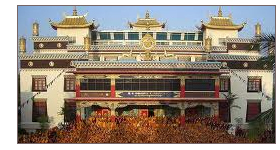 Namdroling Monastery near Mysore is a Buddhist town where around 5000 lamas, (both monks and nuns) practice and preach the lineage of Tibetan Buddhism, forming its largest teaching center. Recent excavations at Banavasi in North Karnataka unveiled the Buddhist Stupa remains structured like a dharma chakra. Sannati in Gulbarga District still serves as a glorious link of Buddhism with Karnataka state. Continuous excavations conducted here revealed traces of the oldest Buddhist sites in the region including Buddhist relics of two stupas, three mounds, a fortification, 4 major rock edicts and a Buddhist settlement. Some of the precious inscriptions on rock erected by Emperor Ashoka adorn the Buddhist heritage of Karnataka. The edicts in Siddhapura depict Ashoka as a lay worshipper, zealous about Buddhism after visiting Samgha in Brahmi script and Prakrit language. Brahmagiris Ishila, one of his provincial capitals where rock edicts dated 3rd century BC were discovered. These inscriptions are also an important from the viewpoint of assimilation of Buddhist culture and language of Brahmi and Prakrit in regional Kannada culture. Jatinga Rameshvara and Siddhapura also comprise the heritage of Ashokan edicts in the district. Maski of Raichur District hosts a minor rock edict of Emperor Ashoka, discovered by C. Beadon in 1915. This edicts uniqueness lies in its inscription which contains the name of Ashoka instead of the earlier edicts that referred him as Piyadasi, (Beloved of the Gods who regards everyone amiably). Gavimath in Koppala hosts the legible Ashokan edict in the region whereas Palkigundus remains are hard to decipher. Here also, Emperor didnt use his name and referred himself as Devanama Piyadasi  Beloved of all gods. The inscription adds on to the purpose of the announcement by making people realize that anyone can be enthusiastic about Buddhism. Nittur in Bellary District portrays Ashoka as the ruler of vast empire including Persia  Modern Iran. Badami Caves in North Karnataka hosts a natural cave Buddhist temple in the rock cave complex. Also, Buddhist remains from the Badami Chalukyas period were excavated between caves two and three. A major center of Buddhism till 12th century, Dambal has an old Buddhist temple with a 10th century inscription. The temple is devoted to Buddhist Goddess Tara, and in past served to Buddhist monks as a Vihara. The inscription dated 1095 AD reinstates this fact. A Buddhist centre also flourished in Dambal during 12th century, the era when Hinduism was at its peak. Mundgod in North Karnataka is a site offering a glimpse of Tibetan settlements, multi-coloured stupas and painted prayer halls in South. Currently, the complex houses 9 camps with two monasteries and a nunnery. Kanaganahalli is an important Buddhist site where an ancient Buddhist Mahastupa, brick built structures of Chaityagriha, votive stupas, Buddha padas, sculptured panels of Jataka stories and life of Lord Buddha were excavated during 1994 to 1998. Ruined remnants of a monastic complex also belong to Kanganahalli. Also, 50 inscriptions were discovered from this glorious site, including an important excavation of Emperor Ashokas sculpture.